On November 9th, 2015 Education Development Center, Inc. (EDC) and SRI International, with the support of the National Science Foundation (NSF), hosted a one-day Forum on “Next Generation STEM Learning for All” in Washington D.C. The Forum was the kick-off event for the White House Next Generation STEM High School Summit that occurred the next day on November 10th, organized by the White House Office of Science and Technology Policy. The Forum included approximately 80 presentations, representing work funded by a wide range of NSF programs and directorates, as well as close to 75 poster presentations. More than 250 people attended the event including educational leaders from states, districts, schools, and universities; representatives of many federal agencies; policy-makers, press, practitioners and others. 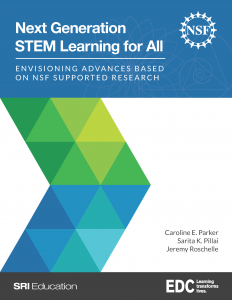 Facilitate networking across stakeholder groups to leverage skills and strengthen connections, collaboration, and coordination toward national goals for STEM education. Importance of building a STEM-literate public and using rigorous research to expand STEM learning opportunities. The need to broaden participation in STEM to include those groups currently underrepresented in STEM fields. Widespread acknowledgement that access to STEM knowledge and skills is a social justice issue that must be addressed to close the widening gaps along income, social mobility, gender, racial and ethnic groups, and individuals with disabilities. Strategies for the preparation of STEM practitioners prepared to facilitate next-generation STEM learning in formal and informal settings. 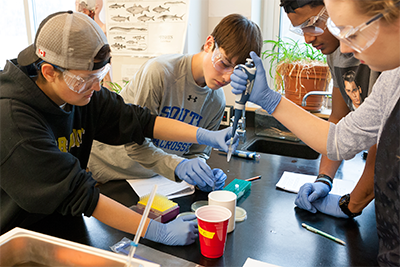 Examples of strong STEM high schools and their characteristics including relationships/relevance/rigor, dynamic assessments, responsive leadership, positive culture, and student agency. Social media buzz about the Forum was strong. By the end of the day, there were 589 posts about the forum using the hashtag #NSFnextgenSTEM and close to a million unique users saw at least one tweet from the Forum.